The phonebook on Ice Cream Sandwich has, for the most part, very similar functionality to that found on previous Gingerbread iterations. It has a tabbed interface, in which the central tab lists all contacts alphabetically. The LG Optimus G's phonebook tabs can be swiped left and right without the need to touch the specific tabs labels, which a step up from the Optimus 4X HD. Contact images, where available, are displayed and there's a quick alphabet scroll on the right. There's also a regular search bar on top of the contacts list. The other tabs are Groups and Favs. Filters keep the phonebook from getting messy - you can choose which groups are displayed and which are hidden (e.g. Family, email contacts, Twitter contacts and so on). The list can be sorted by first or last name and you can choose how contacts are displayed - First Name, Last Name or the opposite. A tap on a contact photo brings up the quick contacts keys. You can use them to call the contact, send them a message or email or view their profile. 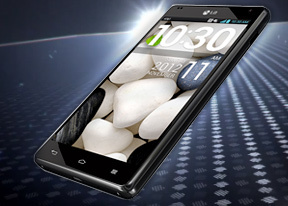 A new addition is the option to initiate a video call, which was lacking on the LG Optimus 4X HD. Tapping on the name of a single contact brings up their details. From here, you can edit the contact's info by hitting the pencil icon in the upper right, while the star icon on the upper right will add them to your favorite contacts. Editing a contact is pretty straightforward; you can add or remove fields as needed, as well as specify the types of phone numbers, email addresses, ringtones, additional fields and even add notes. The LG Optimus G had no trouble holding on to signal (even where signal was poor) and the in-call audio is consistently good and loud too. The Dialer integrates the Call log, Contacts and Favorites, each within its own tab. Again, these tabs are side-swipe-able for convenience. Smart Dial is available and works for both numbers and names. Only one matching contact is displayed, but if you tap the down arrow button, the rest show up as well. We also ran our traditional loudspeaker test on the LG Optimus G and we can tell you right from the get go that it has a very potent speaker on tap. It scored an excellent mark and will undoubtedly be heard loud and clear in most conditions. Aside from that sound was very clear and not just volume-happy. The LG Optimus G can handle all common message types: SMS, MMS and email. Email capability is excellent with support for Exchange available out of box, and social media buffs will be pleased with the level of SNS integration as well. Adding multimedia to a message is pretty straightforward - just hit the attach button next to the text field and select a number of available options, such as images, videos, voice recording, etc. The generic email client supports multiple accounts, and operates in much the same fashion as the Gmail one. If you add multiple accounts, then the Combined Inbox feature will come in handy, although there's no conversation-style view like in Gmail. The LG Optimus G offers a standard QWERTY keyboard, which features both portrait and landscape typing. The keyboard fills up the screen nicely and offers great ergonomics with ample spacing between keys, still leaving enough room above the keyboard for you to see what you're actually typing. The level of speed and accuracy are commendable in both portrait and landscape. There's a dedicated setting that enables keypress vibrations. There is Swype-like input as well, though it's somewhat uncomfortably out of sight in the Input Language submenu. You need to enable Shape Writer instead of the standard QWERTY layout in the settings. Voice input is enabled too, as well as handwriting.